It’s that time of year for resolutions and changes. No doubt many of you have big plans for positive changes. But, just how will you get there? Your yoga practice and the concept of viṅyāsa krama can provide some sound guidance. 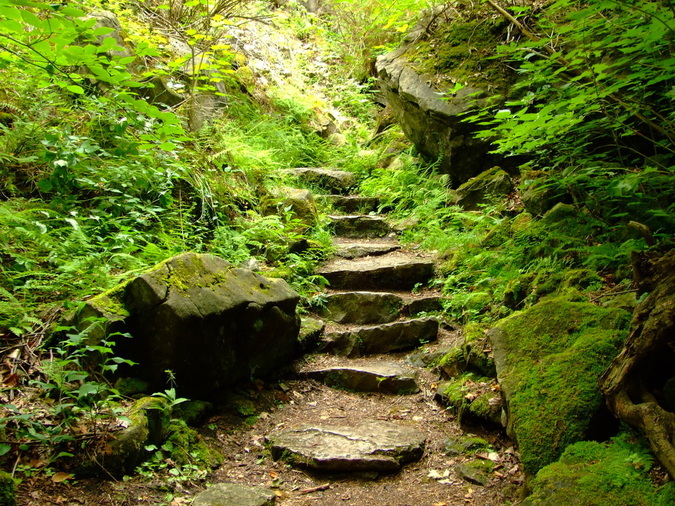 Imagine you are in the forest or mountains and ahead of you is a natural staircase comprised of stone. The ascension is not uniform or predictable, some of the steps are more substantial or minimal, the stride from one to the next may be great or simple and every so often there will be secure plateau to pause. This is the embodiment of viṅyāsa krama. Every asana, meditation or pranayama can be viewed as steps in a staircase. Some of them are accessible and easy to run through and others require a little more time, consideration and preparation. Every once in a while, we have to go back down to the bottom and start again. And every so often, there is a natural plateau or pause. Consider a challenging arm balance like parsva bakasana (side crow). The first kramas of this pose are are fostered and nourished in adho mukha svanasna (downward facing dog). Active hands, arms and shoulders working to support the body create the strength and structure for parsva bakasana. As your practice expands, you are engaging the energy of manipura chakra and tapping into the lift of uddiyana bandha. A major step along the way is finding bakasana (crow). Moving on, developing the twist of the torso in utkatasana (powerful pose), encouraging the triceps to leverage the strength of the thigh in the twist, while the hips stay in line with knees and feet. Keeping this parivritta utkatasana (twisted powerful pose) squatting down to reach your hands and firmly grounding them to the earth. Only then are you ready to test the waters of bearing your weight, your hips and your heart on you hands. Finally, your heart reaches forward, your upper body engages, uddiyana bandha lifts and your feet fly gently off the early. You’ve made it to the summit of parsva bakasana. With each intentional step, respecting the time, effort and energy it takes to work through it, you can get to the top, the apex, the final goal. So how does this affect those resolutions? Those challenges and goals in your life can be viewed as needing the same special steps to work through them. What are those steps, big and little, that will get you to the goal. If your goals is to lose weight, don’t just focus on the final goal, the first step might be a simple one of eliminating soda or drinking more water. If your goal is to organize your entire house, the first step may be to start with a room or better yet, a small drawer. If your goal is to find a new career, the first step may be rediscovering your strengths and passions. If you are not making progress or you fall away from that ultimate goal, what plateau has become too comfortable, how can you move the next step? How can you move in the right direction and in the right way?